Last week I posted a blog article about Baby Boomers and their entry into the realm of senior adulthood. This week I became aware of a wonderful author, Amy Hanson, and her book Baby Boomers & Beyond. I ordered a copy of the book and read it this past weekend. This book and others I’ve recently read have been sobering…and I believe that most of our churches and Sunday Schools are not ready for the coming shift in senior adult ministries that is upon us. Corporate America is already responding to this world-wide aging trend by creating new products and services for older adults…how about your church? Amy asks the reader to consider how the church budgets for its senior adult ministry…is it as important as the student and children’s ministries, or has our ministry to Boomers and those beyond paled in comparison to the efforts we expend to reach young adults, whom we think are the “future of the church.” For the next 20-30 years, the New Old are going to be our future, with great potential to make a Kingdom impact through their leadership, finances, and passion for active living and meaningful ministry in the world. Amy points out that our society discounts the value of the aged in favor of younger adults, and that if we aren’t careful, our churches can fall victim to thinking like the world does. If we aren’t careful, the church will cause “the new old” to disengage with the church as they seek other avenues through which to make a difference in their communities. 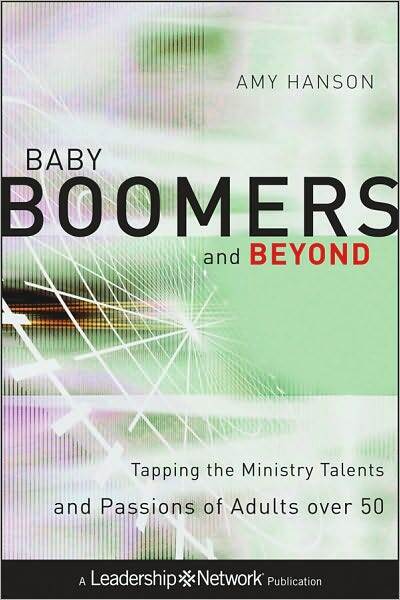 How is your church allowing Boomers to create and direct new ministries they are interested in? Realize that Boomers won’t resonate with potlucks, fall foliage trips, and game nights. There’s nothing wrong with these classic ways churches have tried to address senior adults’ needs, but this won’t attract the Boomers and retain them in your church’s senior adult ministry. In fact, churches should consider having several different ministries to senior adults. What would those be? You’ll have to pick up a copy of Amy’s book and find out! Amy has divided her book into 3 major sections: The New Old, the Boomer and Beyond World, and Implications for the Church. A combination of research statistics and practical ideas make this a must-have book for your personal ministry library. Don’t ignore this age-wave…learn to ride it and to help your church meet the spiritual, physical, emotional, and practical needs of seniors. To order a copy of Amy’s book, click here to jump to it’s landing page on Amazon.com. Previous Is your Senior Adult Sunday School ready for the Coming Boomer Wave?